On the seventh day of a manhunt for a survivalist suspected of killing a state police trooper, scores of police were trying to flush him out of the dense, swampy northeastern Pennsylvania woodland. Police say they are eliminating possible hiding places for the suspect, 31-year-old Eric Frein, including hunting cabins, campsites and other occasional residences in the Pocono Mountains. An intense late-night search Thursday concentrated on the area around Frein's parents' home, with roads blocked and residents kept from their homes temporarily. Linda Kuznesoff-Herman and her husband didn't get very far as they tried to make it back to their home. They kept running into roadblocks as investigators continued the manhunt, CBS Scranton affiliate WYOU-TV reports. "Every officer was carrying a shotgun," Kuznesoff-Herman told the station. "I just never really saw shotguns and all this stuff with the officers like the Wild West." "We're staying inside," Pat Tumbiolo told WYOU-TV. "We've got our guns loaded, doors locked and our dogs have full roam of the house now at night." "We're systemically taking away any opportunities for him for cover and concealment, for any comfort," Lt. Col. George Bivens told reporters Thursday afternoon, hours after the funeral for Cpl. Bryon Dickson. Frein is charged with killing Dickson, 38, and wounding Trooper Alex Douglass in a late-night ambush Sept. 12 outside the Blooming Grove barracks. As many as 200 law enforcement officers at a time have been casting a wide net around the crime scene, exploring rugged terrain so impenetrable in spots that police choppers can't see through the forest canopy. 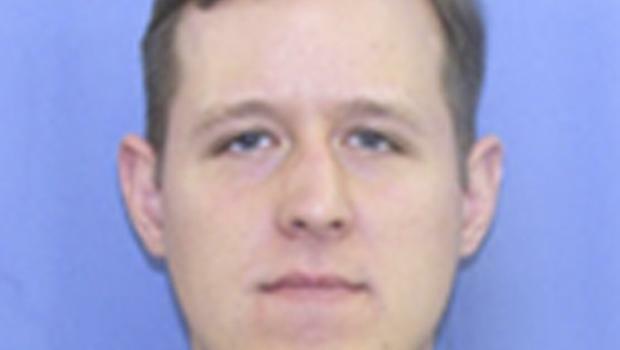 Schools in the area will be closed again Friday as authorities look for Frein, who was added Thursday to the FBI's Ten Most Wanted list. A total of $175,000 in reward money is being offered for information leading to his arrest. "We have now made the world where he could hide a very, very small place," said Edward Hanko, special agent in charge of the FBI's Philadelphia office. As the search continued, thousands of law enforcement officers from around the country came to Scranton to pay their respects at Dickson's funeral, lining up 10 deep for the funeral procession under a brilliant blue sky. A single bell tolled for more than 20 minutes before the casket arrived, and the sea of uniformed officers stood at attention in silence. Inside St. Peter's Cathedral, friends and colleagues called Dickson a devoted officer who put his family first. Dickson "was no ordinary trooper," police Commissioner Frank Noonan said. Dickson regularly worked past quitting time to take drunken drivers off the street, Felsman said. "He held himself to the highest standards as evidenced in every aspect of his life," he said.